If you’re looking to outfit your kitchen with the best healthy cooking tools or just learning the basics of healthy cooking, then this blog is for you! No matter your budget or cooking expertise, you’ll find tools to take your cooking skills over the top. All these basic tools are dishwasher-safe and actual brands that I have tested in my own kitchen. Feel free to mix and match or make a wonderful gift basket for the cook in your life, or to outfit your own kitchen. A set of two or three Stainless Steel Tongs that are also light and easy to handle will make cooking proteins and veggies a snap. They’re also dishwasher-safe for easy clean-up. Cutting Boards are a must for cutting up veggies and fruits, perfect for everyday use. Go for a set of inexpensive plastic boards so you don’t have to hand wash in between uses. 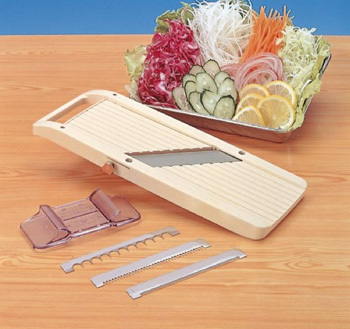 Forget all those slicers and dicers you see on TV infomercials – this Japanese mandoline is the last one you’ll ever buy. I used it working in restaurant kitchens, and you can use it too to make paperthin slices of your favorite veggies for chips and salads, thinly slice rich tasting Parmesan and even turn zucchini into thin noodle shapes. Officially termed a fish spatula , this spatula is good for just about everything — it has a slender and flexible edge that easily slides underneath fish, eggs, or other healthy filling proteins you love to cook. This lean stainless steel microplane with sharp teeth is the best one I’ve tested and it also happens to be one of the cheapest around. Use it to dress up your meals the healthy way by grating whole spices (like nutmeg), grating garlic cloves or ginger root instead of mincing — and quickly shaving away citrus zest. A sturdy pair of kitchen shears can be used in hundreds of ways — from trimming veggies and snipping herbs or even trimming up chicken or clipping meat for stir fries. Simply twist the stainless steel blades to pull apart for fast clean-up. Not all peeler work the same and I’ve tested so many that make peeling a potato a serious chore! But this Swissmar Peeler never seems to get dull, as long as you don’t put it in the dishwasher. It will peel through tough potato skins and delicate fruit peels. 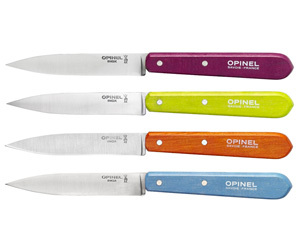 Having an inexpensive set of paring knives on hand makes slicing garlic, herbs and veggies a cinch. Having a set also means you’ll have to sharpen them less often. A sturdy 8-inch chef’s knife is definitely worth the investment. With the proper care it will last a lifetime. If you want a more complete set of knives, a 8-Inch bread knife comes in handy for cutting bread, winter squashes, watermelons, and harder-to-cut items. One large skillet and one small is all you’ll need to make many of the recipes featured in my healthy cooking programs and on this site. But if you want to splurge and go all out, get the cookware set . Cast iron skillet or enamel coated cookware are both safe options for a non-stick surface. These aren’t must haves to start basic cooking but they certainly make life easier! Drop some hints when your birthday or the holidays roll around, or put them on your healthy cooking tools wish list. The Magic Bullet Express is a perfect mini blender that fits well in small apartment kitchens, and ideal for households of 1 or 2 since you’ll blend everything in 2 cup portions. Place the cups and the blade into the dishwasher for easy cleanup, and it comes with a collection of cups so you can have several smoothies weekly without hand washing. The KitchenAid Immersion Blender lets you blend soups right inside the pot. Make smooth sauces, or home-made baby food with a push of a button. 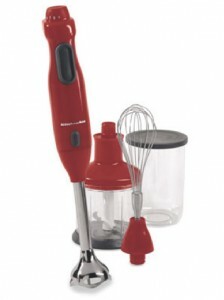 This model also comes with an attachment that doubles as a mini-chopper and electric whisk. The bottom part detaches and pops right in the dishwasher for super simple clean-up. For dishes like Pesto and pizza dough, the Cuisinart food processor will cut your prep time in half spot on your counter. Perfect for chopping and grating veggies for your favorite healthy meals including stews, salads, and snacks! The “Best of Blenders”, this Blendtec blender has a powerful motor that won’t stop until your smoothies, veggies, and ice-based creations are silky smooth. Unlike other blenders, its carafe is not as tall so it fits under wall-mounted cabinets. Slow cookers come in different shapes and sizes, but they are all easy to use and most brands do a good job. Oval cookers are best for fitting roasts, and smaller round cookers can be better when cooking for two. Besides freshly ground coffee, coffee grinder are ideal for grinding spices and making your own oat flour from old fashioned oats. Hey there! I’ve been reading your web site for a long tim noow and finally got the bravery to give you a shout out from Austin Tx! Thanks for the tips on what kitchenware I should buy. I definitely agree, the electric tools make cooking a lot easier! The mini-blender and slow cooker are two things that I have seen my mom use before, and I would really like to have.